We’ve developed a plan for Marrickville that retains areas valued by the community and transforms Carrington and Illawarra Roads. Have your say. A diverse and vibrant community focussed around a reinvigorated Illawarra Road. A new station forecourt plaza that will be a central meeting point of the Marrickville Station Precinct with a range of active uses. Future development along Carrington Road will deliver improved connections and new open space to support residents of the Marrickville Station Precinct. Valued neighbourhood areas are retained. Improve the quality of the public areas with new footpaths, street trees and street lighting to create a great place to live and work. A potential new park along the rail line could provide a new and interesting place for leisure and recreation. 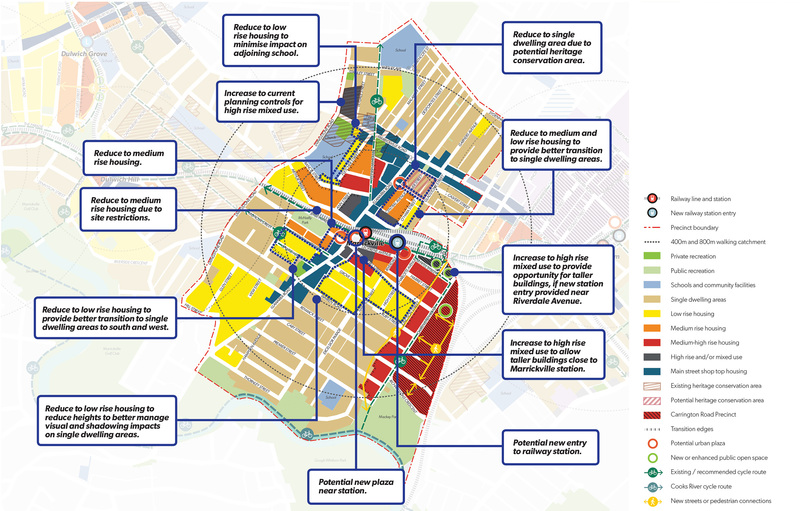 This map shows the key changes that have been made to the Marrickville Station Precinct Plan as a result of your feedback. Sydney Metro will prepare a Public Domain and Station Access Plan for improved station design, accessibility and interchange with other modes of transport. The new metro station at Marrickville will provide improved pedestrian and bicycle access. DP&E will finalise the Strategy including a local planning direction (a Section 117 Direction) to guide future development. DP&E is preparing a draft Special Infrastructure Contribution plan (SIC) to identify the regional infrastructure improvements required to support growth in the Corridor. The SIC levy will fund a range of community, transport and open space infrastructure. The Department of Education will identify locations for new or expanded schools within the corridor based on the growth proposed in the Strategy. DP&E will provide funding to Councils through the Precinct Support Scheme to improve amenity and infrastructure within the Corridor. Inner West Council will prepare a planning proposal to protect newly identified heritage conservation areas along Silver Lane and Gladstone Street within the Marrickville Precinct. Plans for improved connections to existing open space will be included in proposals to rezone existing industrial land along Carrington Road and Myrtle Street. Large sites subject of planning proposals will also be required to deliver new public open space within their sites. Heritage and Federation streetscapes need to be preserved and more streets retained for low density housing. Growth on industrial and under-utilised land is generally supported such as Myrtle Street and Carrington Road. A pedestrian and cycle corridor along the railway line with connections to the station, Cooks River, open space areas, Sydenham and Tempe is supported. Environmental issues need to be considered including addressing local drainage, stormwater and flooding impacts. More detailed information on your feedback can be found in the Marrickville Station Precinct Plan.